Home/2nd Monday/The last 2nd monday? Joanne shared these lovely items that she has recently finished. The green wool purse with needlefelted flowers was something that she was working on at out last gathering. It turned out great. I believe that the sweet dolls in rag baskets are probably inspired by the new grandbaby. She is justifiably proud of her newest rag rug. It is doublewoven and one side has rags that she has braided together. Interesting to see how different the two sides are. The braided rag side has lots of depth. But oy vey the amount of time that added to the prep time; not my favorite part to start with. 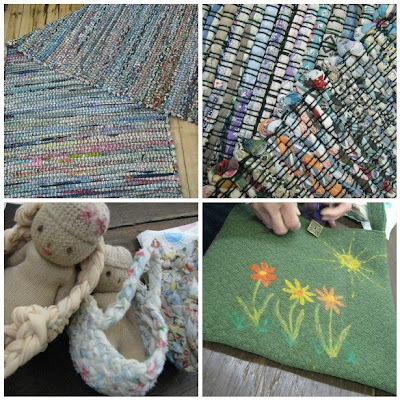 Go to Joannes blog to see how she created these incredible rugs. The top 2 pictures are just a couple of Barbs finished projects. We don’t even try to keep up with her productivity, we just shake our heads in amazement. Her beautiful hand dyed shawl and another strip purse ala Doni’s deli, I think that this makes 3 finished purses for her. 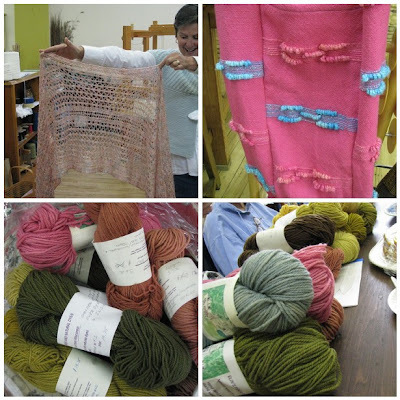 The bottom two pictures are some of Elin’s naturally dyed yarns. 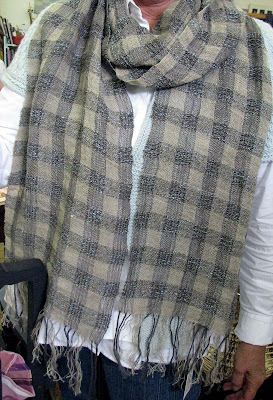 Susan of Avalanche Looms has finished a scarf using linen and a knitting yarn from Berroco called Seduce. I am using the same fiber in a spaced weave scarf that is on my Glimakra. I am loving how it looks woven. 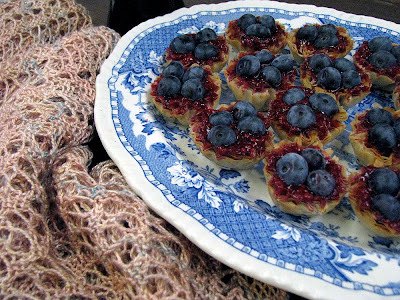 Linda Kennedy of Elk Run Handwovens has most generously invited us to her studio for our next gathering on July 20th. She wants to share with us what she has learned from a class she has taken at Sievers in diamond rag rugs. Her invitation comes at a good time, with the fate of our studio space up in the air. We are a few people short of being able to continue to pay the rent, so I have been hauling 5 years of accumulated fiber supplies and looms home the last few weeks. And wouldn’t you know it, just the very day that I take down the sign and the window boxes a business comes forward, wanting to share the space. So we will see. The good part being that I now know that I can fit my entire weaving studio scattered about the house without anyone having to sleep in the treehouse. Although there have been some definite rumblings. I have banished the dolls from the “playroom” turned weaving room. They were kind of creepy, just staring at me from the corner. And the dollhouse is down in Jim’s workshop “for repairs”. Below is a picture of my new digs. When I finish taking over the loft I will post more pictures. As much as I hate to see Kindred Threads close, a studio at home is truly a blessing. Your soon-to-be studio looks glorious, what with those vibrant colors and that wonderful window. It looks to be a great 'working' space. I don't want to see it end– it's such a good place. Is there still a chance?